Eoin Bradley has yet to make a decision on his future beyond this season after being offered contracts by Irish League clubs Coleraine and Glenavon. Bradley, who has been playing for Coleraine and is the club's top goalscorer, is considering his options. It looks increasingly unlikely that Bradley will feature for Derry in gaelic football, but says he is willing to play if asked by boss Brian McIver. He is also pondering offers to play gaelic football in America this summer. The Donegal club in Boston are thought to be one of the clubs seeking his services. If he decides to spend the summer in the States, there is a distinct possibility that he could miss the start of the 2014-15 Irish League campaign, which commences in mid August. The Glenullin clubman has been absent from the Oak Leaf squad which has qualified for the Football League Division One semi-finals, having chosen to concentrate on his soccer career this term. There is still a chance however that he could be called up to the panel for this summer's Ulster Championship by manager Brian McIver, ahead of Derry's first round tie against Donegal on 25 May. 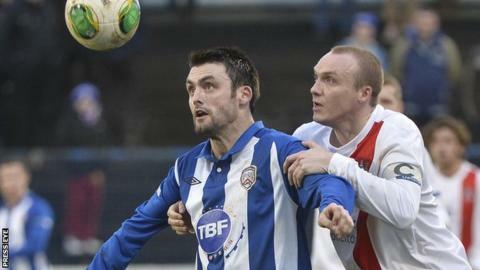 Bannsiders manager Oran Kearney is keen to retain the services of Bradley, who has found the net 12 times this season. He is under contract with Coleraine until May, with the Ballycastle Road club playing their final game of the season against Dungannon Swifts on 26 April.